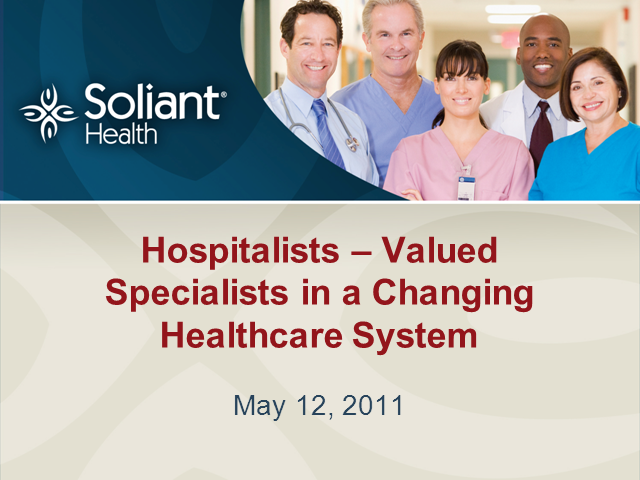 Soliant Health is one of the largest healthcare staffing companies in the country. Soliant Health connects hospitals and healthcare providers with highly qualified, full- or part-time healthcare professionals in a variety of specialized disciplines, including: * Registered nurses and surgical technologists * Physical, occupational and speech therapists * Histologists, cytologists and medical lab technicians * Radiation therapists and dosimetrists * Respiratory therapists and sleep technicians * Radiology, ultrasound, MRI and CT technologists * Family practice physicians, internists, psychiatrists and hospitalists * Pharmacists and pharmacy technicians * Clinical research, support, data management and IT * And much more Whether it’s at the country's largest healthcare facilities in metropolitan cities or at rural hospitals off the beaten path, Soliant Health takes the time and energy to create the best healthcare staffing solutions available. Hospitalists have emerged as important players in the hospital setting. Join us as we discuss their crucial role and benefits they provide to hospitals, physicians and patients.